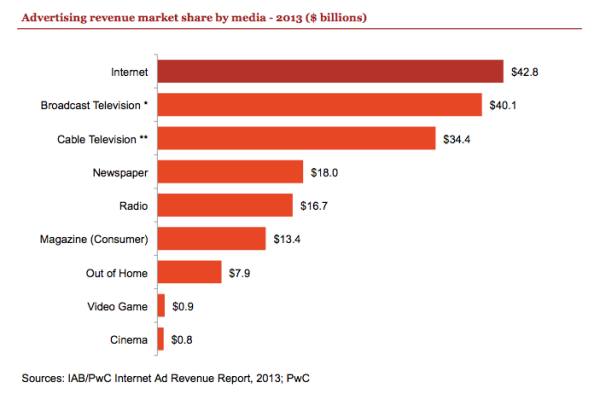 This morning, the IAB released its full year 2013 report on digital ad revenue. Last year, online advertising generated $42.8 billion, which exceeded broadcast TV for the first time, by nearly $3 billion. However, broadcast and cable TV combined were worth $74.5 billion. Search advertising in 2013 brought in $18.4 billion, up from $16.9 billion in 2012. Last year search represented 46 percent of total digital ad revenue. This year however it’s down to 43 percent, although it remains by far the largest single ad category. While search was the largest category, mobile was the fastest growing. Awkwardly, in the IAB scheme, “mobile” is identified as a stand-alone category rather than a format like the others. However mobile includes search, display and video lumped together. The specific formats within the mobile category are not broken out by the IAB, though search remains the largest there too. Overall, mobile ad revenue essentially doubled from 2012 when it was just under $3.4 billion. In 2013, the IAB reported that mobile revenues grew to be just under $7.1 billion.